When I picked up the Cheddar and Caramelised Orange Bauble I also picked up a soft drink from the takeout section of Marks and Spencers. There was quite a variety of flavours but I went for Moroccan Mint and White Tea Drink as that seemed refreshing and funnily enough shopping can be quite warm. I wear a coat and shops put their central heating on. 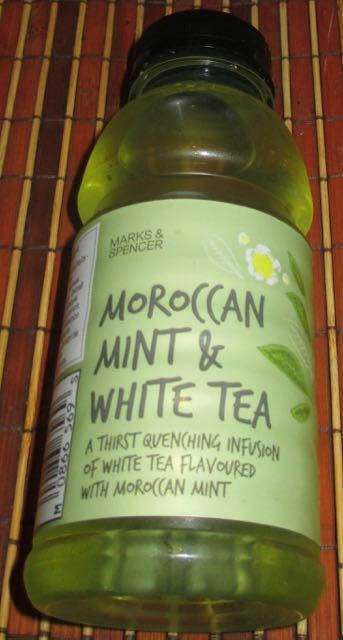 The drink is a mix of white tea and mint, according to the front of the label and is a very pale green in colour. The ingredients list reveals there is also grape juice, which explains the gentle sweetness of the drink. The mint is the most significant flavour, and it's cooling taste did the job perfectly. I can pick up on a fruity flavour I wasn’t expecting too, I put this down the to grape but it had a slightly tart edge, more citrus like. I was expecting to find lemon in among the ingredients, but it wasn’t listed, so the zesty part must come from the combination of white tea and grape. I’m not sure what flavour I was expecting from the white tea, but that slight bitterness must be it. Anyway this is nice fresh tasting drink, and does quench the thirst. It reminds me in flavour of a Virgin Mojito, with its minty herby twist. It is possibly better suited to hot days, but it is easy to drink and works with warm shops too.